UNITED KINGDOM -- A little girl torn apart by savage dogs lay on her hospital bed as nurses pumped her full of painkillers and pleaded, "Mummy, please don't let them put me down". Five-year-old Leah Preston heard the vicious animals who mauled her in Low Hill, Wolverhampton, had been destroyed and was worried she might be put to sleep, her family said. Doctors said the youngster was in a stable condition in Birmingham Children's Hospital after undergoing surgery for bite wounds to her leg, groin and arm on Friday. Onlookers watched in horror on Thursday afternoon as schoolgirl Leah was tossed around like a rag doll being viciously savaged by the two animals. She was playing in her front garden in Hawksford Crescent when the two dogs, named Gina and Kaiser, escaped from a metal cage behind the next door house and attacked her. The Bull Mastiff cross-breeds tugged her between each other, tearing chunks out of her flesh before turning on their owner and her two young children, witnesses said. The owner of two dogs, Jean Harvey, today broke down in tears, shaking and unable to speak, as she tried to relive the horrific incident. With bloodied teeth marks covering her arms, Ms Harvey wept as she vividly recalled the two dogs attacking her, her two children, Liam, five, and Lauren, three. Friends said she had used her body as a shield to protect her five-year-old neighbour, who was being torn apart by the two fighting dogs. Ms Harvey's sister-in-law, Diane Harvey, said: "As far as I know she went to feed the dogs and next thing she realised they was not there. " She heard a scream and she has run out to save Diane's baby next door. "Even though her two were outside she ran straight to the baby. She then threw her body on top of the baby so the dogs could not get to the baby any more. She is bitten from her shoulders all the way down to her heels because she used her body as a shield. She keeps saying, 'I tried to save the baby'." 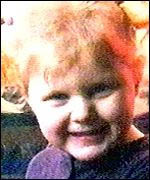 Leah's mother, Diane Reynolds, 28, looked on helplessly as they mauled the little girl, biting flesh from her body and leaping for her throat. Leah's uncle, Peter Reynolds, 38, received a frantic phone call from his sister to say that the dogs were attacking her daughter. He said the family had only moved into the house five days before and he had boarded up the back gate because they had been afraid of the dogs. He arrived on the scene in minutes to find Leah inside the house covered in blood and the two dogs attacking the Harveys next door. "It was savage, man," he said. "It was like she had been mauled by a shark it was so horrific. "The two policemen were crying. We knew the dogs were dangerous. I think it is criminal to breed dogs like that. I want the breeder prosecuted and the rest of the dogs killed." Family friend Carol Read, arrived at the scene to find Ms Reynolds screaming from inside the house, "Please, Carol, save my baby". The 47-year-old, of nearby Showell Road, said: "I saw the dogs and at first I thought they'd got a rag doll. Then I saw there was one dog going for Leah's throat. That child looked like the victim of a shark attack. "I was a coward when I saw what was going on. I turned away and screamed for somebody to help me. "Nobody would come so I knew I had to get that baby. When I picked her up my hand almost went through her leg. Leah's aunt, Linda Reynolds, 39, said: "She has lost all the muscle in her leg. "There are bite marks on her head, on her arm and on her throat. But she never even cried. Not after the attack. "The baby in hospital said to her mum, 'Mummy, don't let them put me down'." The two dogs were taken away by vets and destroyed, a police spokesman said. Chief Superintendent Tom Duffin said officers were still investigating the incident to determine whether or not any prosecutions would follow. He told a press conference today at Wednesfield police station: "What happened yesterday was a really nasty event. "The thoughts and emotions of people must be with those people but the police must continue their inquiries. "It is harrowing. I have taken steps to ensure that staff involved receive proper support." WASHINGTON -- The owner of a pit bull and the homeowners' association at Issaquah Highlands might be heading to court. Peggy Noblitt, 37, says Blu Gator, her 1-year-old Staffordshire pit bull terrier, is being discriminated against by a requirement that she wear a muzzle. 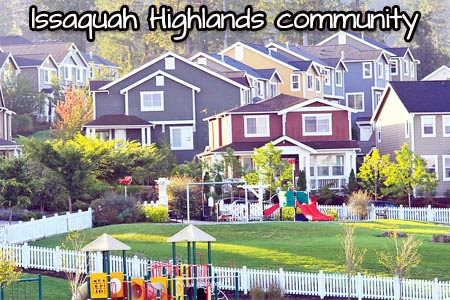 "I'm fighting this," said Noblitt, a three-year resident at Issaquah Highlands. "I do not want to adhere to any unique or discriminatory rules." But Noblitt's dog was "grandfathered in," so long as certain conditions were met. 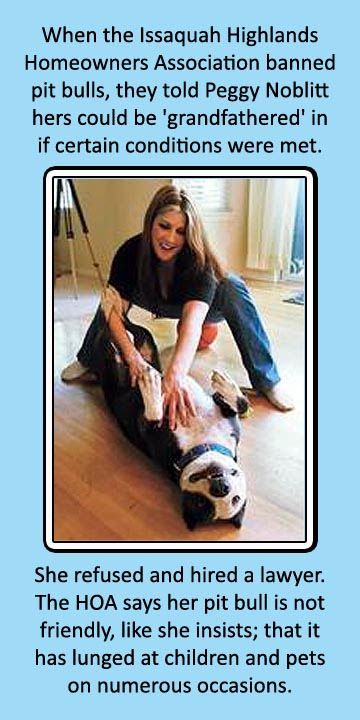 In addition to the muzzle requirement, Noblitt must, among other things, spay her dog, confine it inside a secure kennel when it's in the backyard [by itself] and [maintain] $250,000 of liability insurance [which can be as simple as a rider attached to your homeowner's insurance]. "If that can't be done, we'd have to pursue legal steps," Kirk said. He declined to say what those steps might be. "Every person that has met her adores her," Noblitt said. "All she wants to do is play." "It's clear under the CCRs (covenants, conditions and restrictions) ... that they have the power to do it." "It's cost me a fortune," Noblitt said. "I have a three-ring binder on this whole issue." "Our only choice now is to take the next step," Zimmerman said.